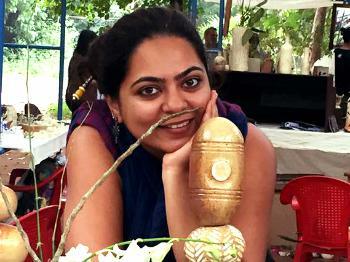 Strong design - Functionality - Ethnic Based out of Auroville, Tamil Nadu, Sabrina creates a range of functional ware and ceramic art at her studio. From the preparation of the clay to the final firing of the work, each stage is carried out only by the artist - a one woman show. Absolute care and precautions are taken in the packaging of the work selected. Courier services used for shipping are well known and reputable. In case of damage, and breakage via shipping, no refund will be made. Kindly do get in touch with the artist in such a case. In case of damage, and breakage via shipping, no refund will be made. Kindly do get in touch with the artist in such a case.